acting schmackting: Let’s talk about our feelings! The best improv comes from allowing yourself to be vulnerable when all eyes are on you, so stop protecting yourself with that contrived "schmacting"! In this workshop we will explore playing scenes with real emotion. You will learn how to launch yourself headfirst into an experience, engaging both physically and emotionally. Allow yourself to take emotional risks, and be truly affected by you scene partner. Allow how you feel to create your point of view, and watch your improv reach new heights. No “schmackting” necessary. 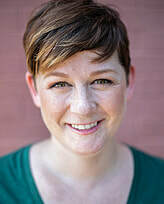 Kristen Schier is the Co Artistic Director of Curious Comedy Theater in Portland Oregon and was the former long time Improv Producer at the Philly Improv Theater. Kristen was also the long time Artistic Director of the Philly based short form ensemble The N Crowd for 13 years. In addition to teaching and directing Kristen brings extensive performance experience in both scripted and unscripted theater, as well as clown. She has worked regularly as an actor with various professional theater companies in Philadelphia. Kristen has toured both internationally and around the country performing, teaching and headlining at improv festivals in Seattle, Edmonton, Chicago, Toronto, Vancouver, Boston, Montreal, Providence, Austin, DC, Baltimore and Detroit - to name a few. Kristen has a BFA in the Performing Arts from The University of the Arts Ira Brind School of Theater, where she was a Senior Lecturer having taught Acting for Non-Majors, Freshmen Acting Studio and Improvisation for the Actor. In addition to training she received at UArts Kristen continued to pursue her education in long-form improvisation with intensives at The Second City in Chicago, The Annoyance Theater in Chicago and The Magnet Theater in New York as well as workshops in physical theater through Pig Iron and The Movement Theater Studio in New York City.